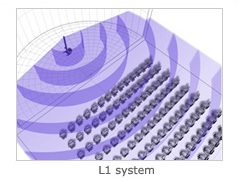 The L1 System will project and fill a room better than systems 10x its size. It is much less prone to feedback. It has a minimal and elegant profile, blending in easily. It’s design allows better clarity and audibility even in the back of the room. What makes the L1® portable line array so different? It begins with the shape. Each L1 system contains a column of many closely spaced drivers mounted in a tall, slim enclosure. This unusual design has profound effects on the sound. Because of its shape, the L1 system projects sound waves that expand out and to the sides, but sends very little up and down. Sound spreads more evenly across the stage and into the audience, and the sound level drops off much more slowly than from a conventional speaker. Sound levels stay so consistent throughout the venue, there’s no need for separate monitor and PA speaker systems—and the L1 system provides sound for both stage and audience. You have complete control over your sound, and you no longer have to wonder what your audience is hearing. L1 systems spread the sound at nearly 180 degrees, so tone quality stays smooth and even from side to side. The L1 Model II system takes this uniform coverage even further with proprietary Bose® Articulated Array® speaker technology. Individual drivers in the line array are angled slightly to the sides in an alternating pattern to help deliver our smoothest, most uniform coverage. Even people off to the sides can enjoy crisp, detailed sound. Most importantly, the Bose L1 simply sounds better than any other speaker system we’ve ever heard, and this is important to us, as we want our customers to have the best possible sound for their event!